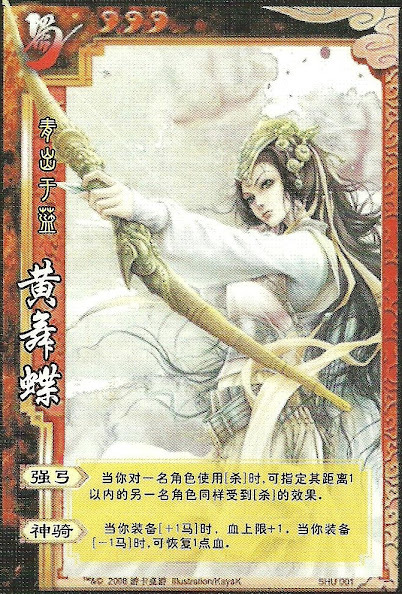 When Huang Wu Die attacks someone, she can attack anyone within one distance. While Huang Wu Die has a +1 horse equipped, her maximum health increases by one. Each time Huang Wu Die equips a -1 horse, she recovers one health. Huang Wu Die can attack the same person twice with "Powerful Bow". "Skilled Rider" can only be used to increase the maximum health while the +1 horse is equipped. If she loses the horse later on, her maximum health decreases back down to normal. Huang Wu Die recovers one each time she equips a -1 horse. This is even if she already has one equipped and replaced.